I'm obsessed with pies right now. We've stopped making galettes at the restaurant where I work & have made the infinitesimal leap to pies. My mind is always racing with ideas when I get home, so I took it upon myself to make pies all week long. my peach hand pies or empanadas, depending on your current location in the world. It's a pie that fits in your hand, so that part is easily explained. A panade is a mixture of butter, water and flour that forms the base of choux pastry [a video]. SO...An empanada is basically, a panade that has been turned into dough, which is then wrapped around a filling (usually savory) and baked or fried. 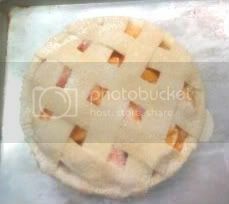 You can use a basic pastry dough to make all of the pies listed in this post. You can use a basic ratio to produce any pie crust: 3 parts flour, 2 parts fat, 1 part ice-cold water. After this, the results/ingredients can vary. For a flaky crust: the fat should be rubbed into the flour until the pieces are pea-sized. For a mealy crust: the fat should be rubbed into the flour until the mixture resembles cornmeal. As far as fat goes, the same principles for pie dough apply to biscuit dough. Click here to read what I have to say about that. To make the pastry, combine the flour, salt, and sugar in a food processor. Add butter (fat) and process until mixture resembles coarse meal. If making by hand, place dry ingredients in large bowl, add butter (fat) and blend with pastry cutter until mixture resembles coarse meal. Add ice water in a slow steady stream through feed tube of food processor with machine running, just until the dough holds together. By hand, mix dough with a wooden spoon, adding water until dough just holds together. Turn dough onto piece of plastic wrap. Wrap and refrigerate at least 1 hour. May be frozen, in double-wrapped in plastic, for several months. Peach filling: Mix peaches sugar and pinch of salt, and add vanilla. Heat over medium heat until peaches release their juice and sugar is dissolved. Bring to a boil. Slowly pour cornstarch mixture into the pot, stirring using a wooden spoon or heat-safe spatula. The mixture will thicken and become stiff. Allow to chill before filling pie. 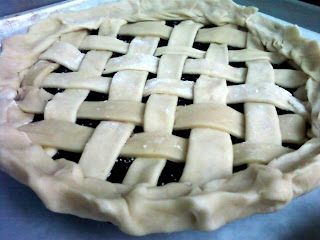 Sprinkle sanding sugar generously over the pies, and place pies in the oven to bake. Bake until the hand pies are golden brown and just slightly cracked, about 20 minutes. Remove the pies from the oven, and let stand to cool slightly before serving. May is National Strawberry month, so I came through with a strawberry pie. No rhubarb in site. I'm too lazy to string it. 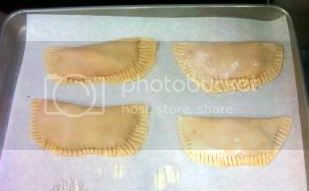 When I first started making the pies, the crust was so pretty, golden brown, sweet...and the filling was soggy and unappetizing. I am not a prize-winning baker, a pie novice, nor an expert, but I think I have a pretty good handle on what to do... Now. 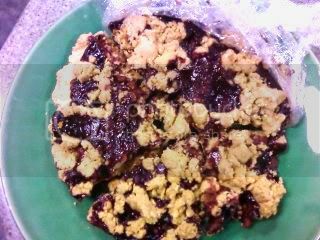 Blackberry Oatmeal Pie. This crust is a crumbled/streusel topping instead of a dough crust. Lower in fat & calories, a streusel is a great substitute for a pie top (or a muffin top, too). In a medium bowl, combine flour, cinnamon, brown sugar, oats, and lemon zest. Mix thoroughly, then cut in 1/2 cup butter or margarine until mixture is crumbly. Sprinkle streusel on top of pie filling. Bake according to mealy or flaky pie crust instructions. After. 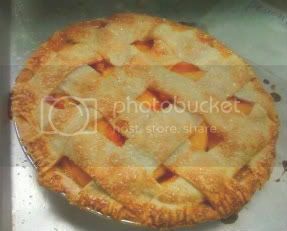 A peach pie with a lattice-top crust. Egg washed & sugared. nothing like a fresh peach pie with a perfect crust. killer! I love those little peach pies. This is the seasin for some pie! Oh my do I ever love a pie! Ah pie! I love pie. You blew my mind with the empanada thing. So those traditionally use something more like a pate a choux pastry? Is it boiled the same way? My sister-in-law makes empanadas that are impossible to pick up and eat. The crust is soft. She makes them from mashed yucca root. It's a Colombian thing. 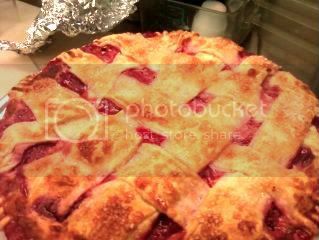 Thanks for making the strawberrypie without the rhubarb. I'm not that big on rhubarb. Then again, if there is no rhubarb pie, I won't laugh. Nikki, you remind me of Alton Brown. I just saw a episode he did on "Good Eats" on making pies and turnovers. You made some great looking pies my fiend. Your lattice is oh so nice. That's no easy feat! All of those look wonderful. Pies are an essential part of the diet! I love the little peach empanadas. Oh..thats looking so delicious..seriously the pies are such wonderful dish! Pie is something I always wish I knew how to make, but just haven't had the effort to learn. These pies look delicious. May have to take the time to learn how to make them soon enough.